Developing an online marketing strategy for your small business can feel a bit like a chicken vs egg scenario. 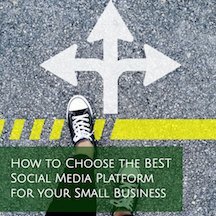 There are a lot of decisions to make as you are first getting started, and many people are naturally drawn towards deciding what social media platforms and online marketing tools they’ll use, as their step one. It’s important to note that part of developing your online marketing strategy is taking into account where your customers spend time online and what your competitors are doing with their online marketing. However, no online marketing strategy is going to be any good without a strong (original) content plan, and I often see small businesses start one or more social media platforms or kick off a blog, but aren’t ready to commit to creating the type of content needed to make that blog or social media profile, a success. Blogging, social media profiles, and email newsletters all require a certain level of consistency as well as frequency in posting activity. The optimal activity level is different for each, but just like with anything else in life, your online marketing requires steady, consistent effort to benefit your small business. Developing your content strategy should include curated content (meaning, content not created by you but that’s relevant and complementary to your ideal customer), but a strong online marketing presence won’t be built on borrowed content alone. That’s where your content creation comes into play. Your blog is not going to benefit you in all the ways blogging does, if you write 3 or 4 posts in your first month and don’t publish a new post again for 6 months, 9 months or longer. A YouTube channel isn’t going to grow subscribers or earn video views if you only record and publish a couple videos, total. An Instagram account isn’t going to be effective at branding your small business if you aren’t committed to regularly taking photos, creating images, and recording videos to post to your Instagram feed. That’s why honestly assessing yourself, your team, your available time, and your skill sets with regards to content creation is essential in developing an online marketing strategy. You don’t want to spend the time or energy in establishing a new online property if you won’t have enough of the correct type of original content needed to make that new online property work for you. Facebook: Links (blog posts, product listings, services pages, etc), photos, or video (live video or pre-recorded). You could have just one type or a combination of all 3. Twitter: Short-form writing, and links. Instagram: Photos or images (posted as a single photo or multiple photos at once), video (1-min max for feed videos), live video, vertical pre-recorded video (for IGTV). LinkedIn: Links, and pre-recorded videos. Pinterest: Images (vertical-crop) and many, many links. On Pinterest, you always want to link any image you upload to the platform, back to your site. Pinterest is wonderful if you have a blog or online store since you naturally have many, many links to use. YouTube: Pre-recorded video or live video (horizontal format, ideally). Email Marketing: Writing plus all of the above. Your emails can take many forms. You can include only an image that advertises a sale or promotion you’re running, Your email can be long form content. Your email can introduce your new blog post and include a link back to your site to read in full. Your email newsletters can even be used to drive traffic to a new video you posted on Facebook or YouTube. If you’re now feeling a bit overwhelmed thinking about all the original content you’ll need to create in order to rock your online marketing, know that there’s a high likelihood you’ll be able to repurpose most if not all of the content you are creating, for use with more than 1 online marketing tool. For example, if you went live on your Facebook Business Page, you’ll be creating content that’s native to Facebook. You can write a blog post about the video and then embed that video into the blog post itself. Then, you can download your Facebook Live video and upload it on your YouTube channel and to your LinkedIn Profile. From there, you can pin your YouTube video link to one of your Pinterest boards. You can edit a 1 minute or less video clip (or clips) and post it to your Instagram profile. If you recorded the Facebook live with your smartphone (or can send your downloaded Facebook Live video file to your smartphone), you can upload it to your IGTV channel. You can also take a screenshot of your video thumbnail, add it into a new email newsletter, write a short description about the video, and include a link that directs your email subscribers to watch the video in full. So, now you’ve created 1 piece of content but used and reused it with many of your other online marketing properties. You want to make sure that you are setting yourself up for success and success that can be achieved without much frustration. Deciding what type of content you can commit to creating is the foundation of developing your online marketing strategy.